Below is a list of expedition dates for all of 2019. If you are interested in dates beyond this… don’t worry! Just send us an email! Importantly, all expedition start dates listed below do have a degree of flexibility. 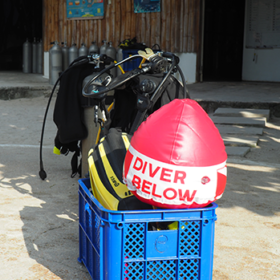 A lot depends on your previous diving experience and qualifications. Please get in touch and lets see what we can work out! If you are intending to dive, our recommended minimum expedition length is four weeks. There are circumstances when we can consider less (again, this depends largely on your previous diving experince). Send us an email and we can discuss the possibilities. We do welcome non-diving volunteers. Have no doubt, there is plenty to do and you will still make a very valuable contribution! If this option would suit you better, then our minimum expedition length is two weeks. Your expedition starts once you join us on the island of Malaspascua. We will of course provide you with detailed information on how best to get there. As you may have guessed, the cost of your expedition depends on a number of things. The two most important are whether you want to take part in diving activities and (pretty obviously!) how long you want to join us for. Take a look below to get an idea of what your expedition fee would be. The fine detail of what is included in this price and what isn’t can be found below. We understand that the decision to join an expedition such as ours is a big one, and we want you to feel sure you have made a good choice. We are always happy to give you the information you need to do this. 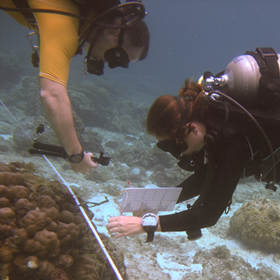 Our science training methods are based on those developed by Reef Check – a global organisation dedicated to monitoring the status of coral reef habitats worldwide. Our on-site field scientist will take you through a course that involves lectures, practical exercises, snorkelling and diving. We have no doubt it will leave you inspired! We work hard to engage the local community in our work. You’re visit here makes a difference to them. But how would you know that if you aren’t involved yourself ? We will ensure that the energy you bring with you is put to good use! And you will see for yourself how warmly the Filipinos will welcome you…. In all aspects of your stay with us, we recognise that your safety is the priority. Our experienced on-site team are dedicated to ensuring that you stay is always safe, yet still productive and fulfilling. We always insist on a diving team that is both experienced and highly trained to take you underwater. Three meals per day, unlimited water, tea, coffee. Excludes the one day off each week. PADI scuba diving training (where applicable). 4/5 diving days per week, weather permitting! At least 2 dives per day. All dive costs (training and research dives) including instructor/dive guides, boat costs, air fills. Full support and guidance (from our locally employed team) as you work closely with the local community on a variety of on going initiatives. Your own People and the Sea t-shirt!